For 100 days in 1994, genocide engulfed Rwanda. Since then, many in the international community have praised the country’s postgenocide government for its efforts to foster national unity and reconciliation by downplaying ethnic differences and promoting “one Rwanda for all Rwandans.” Examining how ordinary rural Rwandans experience and view these policies, Whispering Truth to Power challenges the conventional wisdom on postgenocide Rwanda. Susan Thomson finds that many of Rwanda’s poorest citizens distrust the local officials charged with implementing the state program and believe that it ignores the deepest problems of the countryside: lack of land, jobs, and a voice in policies that affect lives and livelihoods. 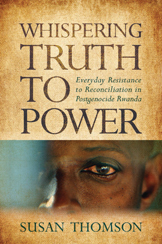 Based on interviews with dozens of Rwandan peasants and government officials, this book reveals how the nation’s disenfranchised poor have been engaging in everyday resistance, cautiously and carefully—“whispering” their truth to the powers that be. This quiet opposition, Thomson argues, suggests that some of the nation’s most celebrated postgenocide policies have failed to garner the grassroots support needed to sustain peace. Susan Thomson is assistant professor of peace and conflict studies at Colgate University. She has published articles in African Affairs, African Studies Review, and The Journal of Modern African Studies, and she also serves as the Amnesty International–USA Country Specialist for Rwanda and Burundi. From New Books in Genocide Studies (http://newbooksingenocidestudies.com/), an audio interview with author Susan Thomson. Click here for full details.